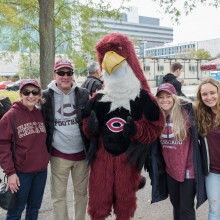 Parents and families are highly valued members of the UChicago community. They have important roles in the success of the College and help ensure students make the most of their College experience. Whether supporting students on campus during Family Weekend, volunteering time or student internships, or financially supporting College programming, parents and families contribute to College students’ intellectual development and academic achievement. Annual events celebrate and mark the progress students make throughout their College education, and they are as much for parents, family, and friends as they are for our students. Engagement with the College can take many different forms, ranging from attending the University’s national Harper Lectures, to giving initiatives, to volunteer opportunities. The College benefits from parents’ and families’ vast range of skills, interests, and talents. 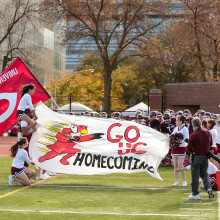 Whether writing welcome letters to parents of prospective College students, hosting internships and networking events for current students, or providing a helping hand during Family Weekend and other family-themed events, volunteering allows parents and families to contribute and be part of College life. Dean’s Parent and Family Council: The Dean's Parent and Family Council is a group of engaged parents who support Dean John W. Boyer's priorities through advocacy, volunteerism, and philanthropy. Parent Ambassadors Circle: Parent Ambassadors are parents or family members who invest in the success of students with annual gifts of $2,500 or more to any area of the College. Asia Parents Cabinet: The Asia Cabinet of the Dean's Parent and Family Council launched in Spring 2018. It is made up of engaged parents who support Dean John W. Boyer and the University of Chicago's growing presence in Asia. Plan your visit to the University of Chicago campus.